Preheat oven to 375 degrees. Coat 6-cup baking dish with cooking spray, and set aside. Add 2 tablespoons Parmesan cheese to breadcrumbs, and toss to combine. Add oil, and using your fingers, toss to coat breadcrumbs. Set mixture aside. In large pot, boil 4 quarts of water. Add pasta and cook for 10 minutes, until slightly al dente. Drain in colander, and set aside. While pasta cooks, in microwave or small saucepan, heat milk until it steams, and set aside. In large saucepan, melt butter over medium heat. Whisk in flour, and cook for 1 minute, whisking slowly. Off heat, gradually add milk while whisking to avoid lumps. Return pot to medium-high heat, and simmer sauce until it thickens to consistency of stirred yogurt, about 3 minutes. Add cheddar cheese, remaining Parmesan cheese, pumpkin, mustard, black and cayenne peppers, and nutmeg, and stir until cheddar melts. Mix in cooked pasta. 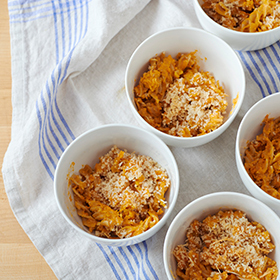 Spread mac and cheese in prepared baking dish. Sprinkle seasoned breadcrumbs over top. Bake 15 to 20 minutes or until breadcrumbs are crisp and golden brown. Serve immediately. Serving size: 1/6 of recipe. Amount per serving: 289 calories, 9g total fat (4g saturated fat), 37g carbohydrates, 17g protein, 4g dietary fiber, 307mg sodium.